If The Enemy Of My Enemy Is My Friend..
Than is the friend of my friend also my friend? 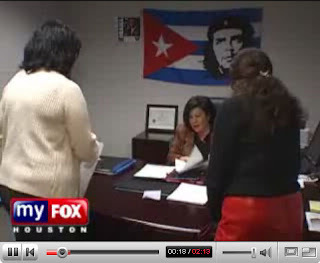 This image is from the unofficial headquarters of Obama's supporters in Houston. Check out the clip below and ask yourself this, what would happen if a Fox affiliate filmed any Republican candidate's headquarters and saw, say, a poster of Mussolini in the background and didn't bother to comment on it? Hell, we didn't even let the nut case Ron Paul get by with having neo Nazi supporters, so how does no one comment on Obama's supporters hanging up a Cuban flag emblazoned with Che Guevara on it, especially when it is larger than the picture of the candidate they support? For many people, Che is a man of great inspiration... not because he was a "terrorist," but because he wanted to ensure that the impoverished and disenfranchised were not ignored. I think despite your traditional view that poor people are a blight, this type of attitude should be nurtured, not villified. Before he was a marxist, he was a humanist. During the time that Che was forming his ideas, he collided head on with the might of the US Government when United Fruit wanted to overthrow the government of guatamala to ensure they were able to get fruit far below market value. Nothing is ever as cut and dried as either the left or the right make it. In this case, I think having a picture of Jerry Falwell would be infinitely worse than a picture of Che Gueverra.